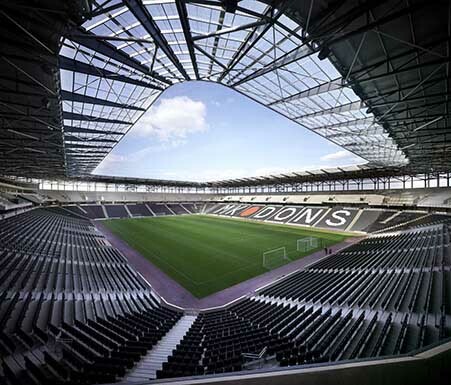 MK Dons have announced that they will be leaving their short-term home of Milton Keynes to move to the capital of the Falkland Islands. Club owner Pete Winkelman has insisted that a move to Port Stanley will be completely beneficial to the club. Port Stanley has a population of around 2,500, not including sheep. With the islands sitting just off the coast of Argentina it is thought that the jetlag-inducing round trip for visiting sides could lead to a formidable home record, not to mention the possibility of near-Antarctic temperatures and colossal rainfall. A new stadium is already under construction called the “Winkelman 1987 FA Cup Winners Arena” with the capacity expected to be 40,000 seats and room to expand to 55,000. Winkelman has stated that “it will definitely be a lot fuller than the ground in Milton Keynes ever was” and that he expects away support to “sometimes be even into double figures for important away games”. With the move the team will change their name to “1987 FA CUP Winners of Stanley FC” and derby day rivals will be Boca Juniors, River Plate and Plymouth Argyle.